Today must be a joyous moment for every Roman Catholic, especially the devoted Filipinos, as another faithful servant of God has been named a Saint. Saint Pedro Calungsod, who was just recently canonized, became the next Saint of the Philippines, second only to Saint Lorenzo Ruiz, Patron of our beloved country, poor and youth, Filipino overseas workers and altar boys, and most especially of the Tagalogs and Filipino-Chinese. For us Filipinos Pedro Calungsod will always be the martyr of thirties who was ready to sacrifice his life to stand for his faith. He will always be immortalized as the Filipino Saint who will ever hold a copy of Doctrina Christiana and a palm leaf (symbol of being a cathecist). 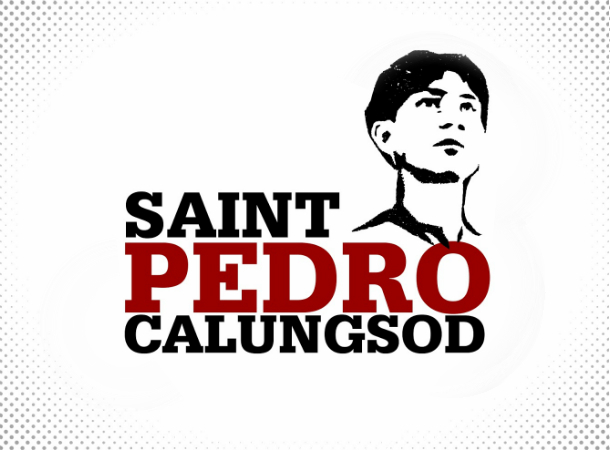 Henceforth, Pedro Calusngod will be known as the Patron Saint of the Philippines also, and of the Filipino youth, Cathechumens, altar boys and overseas workers. He'll be the patron of the Visayans, Cebuanos and of Guam. His feast day is every 2nd of April. On May 5, 2000 the now Blessed Pope John Paul II inaugurated Calungsod's beatification after a thorough investigation the satisfied all the requirements. The beatification is the first formal recognition by the Catholic Church of a dead person's acceptance into Heaven, after proving that said same person is able to intercede on behalf of the people who prayed for his name. The miracle that was associated to Calungsod's beatification was that of a clinically pronounced dead woman, who was revived after a doctor prayed for her through Calungsod's intercession. This miracle was officially approved and accepted by the Holy See on December 19, 2011. After a long deliberation, Pope Benedict XVI announced on February 18, 2012 that the then blessed Calungsod be canonized. The act of Canonization is the moment when the Catholic Church declares a deceased person to be a Saint. On October 21, 2012, Pedro was officially canonized to become the Philippines' second Saint. It is only a wonder to me that despite having millions of devoted Filipino Christians around the world only two have only been declared as Saints after they died.